Jerry Burton, Randy Russell and Terese Howard were each charged with violating Denver’s ban on urban camping and interference with a police officer. Prosecutors said they took far too long to comply with orders to move. Burton and Russell were found not guilty of one count of interference but guilty of a second count that occurred later that day. All three were sentenced with one year of unsupervised probation; the only requirement to satisfy it is court-approved community service. Denver, CO – On Tuesday, April 4, 2017, Jerry Burton, Terese Howard, and Randy Russell, will be pleading not guilty to charges of violating Denver’s Unauthorized Camping Ordinance, also known as the camping ban. 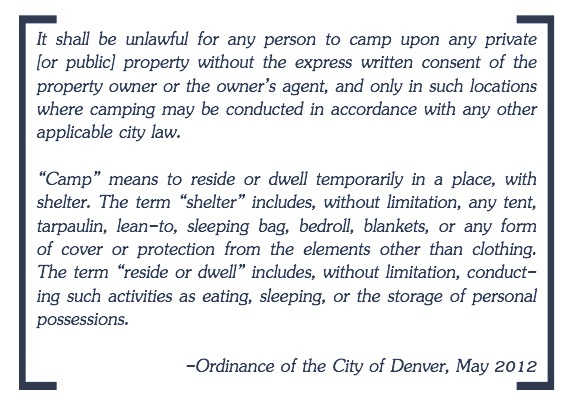 This trial is the first time Denver’s camping ban has been fought in court, however, it is not the first time people have received camping ban tickets, nor is it the first time people living on the streets have had their belongings taken from them by the police without due process of law. On April 3, 2013, Denver Homeless Out Loud (DHOL) published a comprehensive report (PDF) from the information they collected from surveys of over 500 Denver residents living without housing. The surveys essentially asked how the newly implemented camping ban, which went into effect on May 28, 2012, affected their ability to survive. According to DHOL, 24 people have received tickets since the ban’s implementation. On the morning of Monday, November 28, 2016, Burton and Russell were cited for “illegal camping.” Their survival gear including tents and sleeping bags were confiscated as evidence. On the evening of November 28, Burton and Russell were, for the second time that day, cited in violation of the camping ban. Howard was cited her first ticket of the day that evening. A Facebook Live video taken by Kayvan Soorena Tyler Khalatbari-Limaki, which has close to 600,000 views, shows police officers taking blankets off of Burton as he sits on the ground. Burton suffers from Degenerative Bone Disease, and in freezing temperatures like that evening, he says his body locks up in agonizing ways, which makes it hard for him to move. He ended up being driven by a friend to the Veterans Affairs Hospital where he spent the night. Burton is an honorably discharged military veteran. Flores-Williams is the same attorney suing the city of Denver on behalf of DHOL and the thousands of residents without housing in Denver whose rights have been repeatedly violated. The class-action lawsuit was filed on Thursday, August 25th, 2016. Unicorn Riot will continue coverage of this trial, of the class-action lawsuit against Denver, of the Homeless Bill of Rights in CO Legislature, and other issues affecting Denver’s unhoused population.